Painting a part of the interior of your home, or of the exterior, a shade of red is not for everyone; however, if you are looking for a color that will pop unlike any other, then red may be the perfect choice for you. 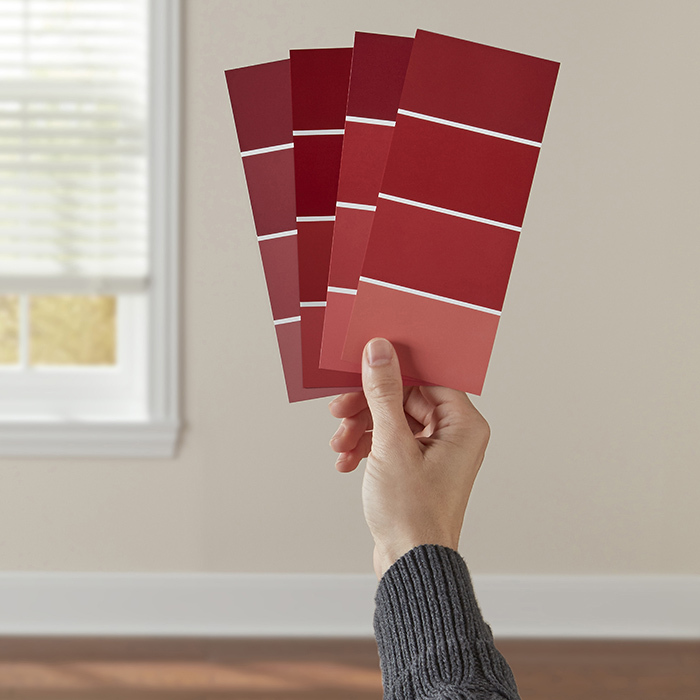 There are many shades of red that can be picked from, when choosing a shade for your home. Red is definitely a bold choice of color. If you are looking for a color that will stand out, and perhaps be the starter for a lot of conversations, then continue reading. Below, you will find some top choices for red paint colors, as well as red paint ideas that can be used around your humble abode. If you are interested in a bright red, almost red-pink color, then consider Behr’s California Red. This shade is a bright red that will add significant detail to any room. Perhaps a room where you would like to paint one wall, as an accent wall, this bright shade of red, or add this red choice to some of the room décor, such as table legs, bookshelves, or matching throw pillows. This is a red that is cheery and will lighten up any room within your home. For a more earthy, deep red shade, consider Sherwin Williams’ Roycroft Adobe. This red is a very warm shade that will create an inviting environment into any room. It is also very attractive on the exterior of a home, as a shade with deep red-brownish hues. This is a nice, soothing choice for a kitchen, dining room, or a bathroom. If a dark, almost red-wine color is more your color, then consider Glidden’s Burgundy Wine. This deep, rich choice is perfect for welcoming guests with a front door enriched with this color, or for a formal dining room. Dark colors, such as this one, tend to warm up a room, especially one that is a pretty large in size. The choices for picking out a shade of red that will add a splash of color to your home are plentiful. With a wide array of shades, you can pick from warm, dark shades to bright, cheery ones. Red is definitely a color that speaks to a homeowner who enjoys vivid, bold views. If you’re planning on adding some red to your home feel free to contact us at Noel Painting.